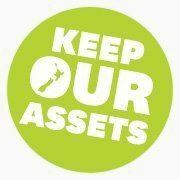 Asset Sales, CIR Referendum Petition, Keep Our Assets! This has been a busy fortnight, and I’ve been ‘doing’ more than ‘writing’. The second reading of the Bill to sell off our energy companies passed through last Thursday, there’s Hansard on it here if you want to find out who voted which way. It has now moved through to the Third Reading; there was a scandalous one hour of Select Committee deliberation of submissions received before it was passed back to the House for the Second Reading debates. This is an abrogation of democratic process to a degree hitherto unequalled by this Parliament. 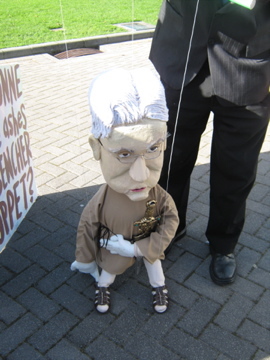 There are anti-sales protests happening all over the place, with Peter Dunne’s Ohariu electorate coming out in arms, placards and puppets. People’s Power Ohariu‘s John Maynard has had quite a bit of media coverage in the past week, to the dismay of the PM, who is beginning to suggest that he may agree that the economy is tanking faster than his advisers told him it would, and that maybe we need the income from our assets more than we need to keep campaign promises to National Party backers. Funny, Russel’s been saying that for months … and this, most recently. There are bigger protests happening every few days, I recommend Thursday this week outside Parliament, from 12 noon. There’s even a FB event here, if you want to see how People’s Power roll currently. 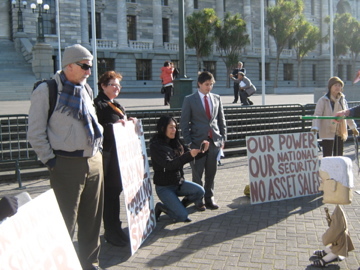 Then, of course, there’s the Keep Our Assets Campaign, a coalition of interested groups including CTU, NZUSA, Labour, Greens, Grey Power, and many interested individuals. These folk are collecting Citizen’s Initiated Referendum petition signatures, which I’ve mentioned before when it launched in May. There will be KOA blitzes happening around the region, but may I draw your attention to one coming up this weekend in the eastern suburbs of Wellington. THIS WEEK ON BACK BENCHES: Watch Wallace Chapman, Damian Christie, the Back Benches Panel and special guests discuss the week’s hottest topics! WHAT THE FRACK? : Fracking – the mining process which blasts a mixture of water, sand and chemicals deep into the earth to extract gas or petroleum. We’ve been doing it for decades but now there is Parliamentary inquiry into process. The Greens are calling for a moratorium on fracking until the inquiry is over but the Government says that’s not necessary. It’s controversial-the practice has been blamed for groundwater contamination and earthquakes. Is fracking safe? Is there enough oversight? Oil and Gas exports bring about $3 billion to the economy. Can we say no to the practice? PAID PARENTAL LEAVE: A bill by Labour’s Sue Moroney says 6 months(26 weeks) rather than the current 3.5 months/14 weeks. The Government says that is unaffordable. Do we need more time for the country to recover financially? Key has left the door open for the future – but will our country EVER be able to afford extended leave? Is it ever a good idea to borrow money for additional entitlements? Or are there benefits, bigger than financial to consider? Join us for a night of LIVE pub politics from the Backbencher Pub: Wednesday, 18th of April. Our Panel: Green Party MP Gareth Hughes, Labour MP Annette King, and National MP Katrina Shanks. Yes, I am having a busy week, so I just stole that again from Wal & Damian’s site PR. 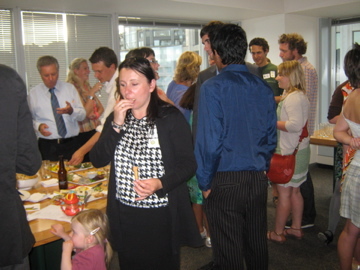 Do come down, last week was the Young Pollies episode which was a very sardine-packed session (I left it to them & stayed home, I’ll admit) – footage here. Wilbur Townsend represented the Young Greens admirably, despite his own personal misgivings before the filming. Student loans policy got a good thrashing, and one or more young pollies got themselves booed by the crowd – but I’m not saying whom, you’ll have to watch it yourselves. Pub politics, every week until mid-year when the channel goes off air … boo hiss, TVNZ! Our public service broadcasting is a backbone of intelligent viewing in NZ, it’s certainly not worth expecting the USA to provide intelligent programming that is affordable and can be broadcast free-to-air, so this is yet another decision made at the expense of our own jobs, our own sovereignty and reflecting our own communities, in all their diversity, on our own screens. I will become an even more averse consumer of broadcasting after this happens; even now I’m more likely to show up and participate in the filming of Back Benches, than I am to watch an episode of anything else that TVNZ broadcasts across all it’s channels. I consider that the standard of programmes broadcast has fallen substantially in the past decade, and that New Zealand residents are getting ripped off by the decisions that favour cheap, rubbishy ‘reality’ show programmes over drama or comedy that could be keeping NZ-based writers, actors and production crews in work, and in the country. If HBO is the only place where we can see award-winning kiwi comedy, then how does that make us look? C’mon TVNZ, pull your socks up and keep our local content on our local stations. Or watch your audience decline to the point where those fat salaries just cannot continue to be dished out to those who make the decisions…. 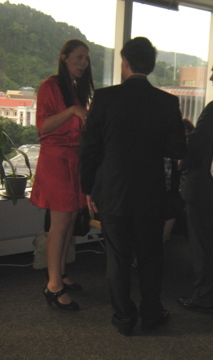 The show ran with Meteria Turei instead of Gareth Hughes (who was ill with a sore throat), and was unintentionally funny every time Katrina Shanks responded to a question with some phrase or other that had been vetted by her minders, but didn’t seem to answer the question. Wallace got in a few good shots there, too, which left her doing the four-year-old “the grown-ups are making fun of me” pout. Go on, watch the episode, I kid you not, she really did that! Annette King actually impressed me when the paid parental leave topic got a second airing, but she was no match for Meteria, who whomped the pair of them on every topic. The episode is here, and well worth a look. Last Chance for Maui’s Dolphins! The Maui’s dolphin is the most critically endangered dolphin in the world. In just a few short years, the population of Maui’s dolphins has halved from 111 in 2005 to an estimate of just 55 left today. The time for talk is over and urgent action is needed. The Government …should use the precautionary principle to put in place an immediate set net ban along the Taranaki Coast and to enlarge the West Coast North Island Marine Mammal Sanctuary. 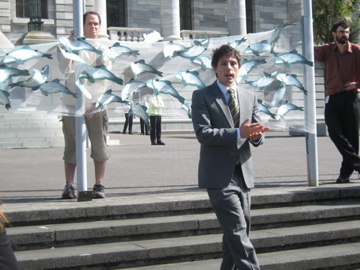 Join Green Party MP Gareth Hughes and the last remaining 55 Maui’s dolphins in front of parliament on Wednesday 28th March to help us call for action and to launch our submission guides to the Department of Conservation and the Ministry of Fisheries to put measures in place to protect this unique species NOW! 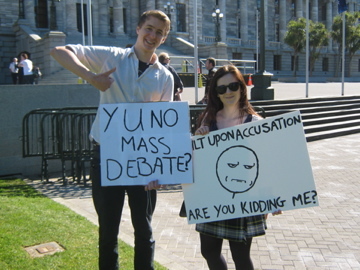 12.30pm – 1.30pm, in front of Parliament steps, Wellington. You can read more about the submission guide here, and see what Forest and Bird have to say as well. Hey NZ Police! GTFO of our Internetz! The first sentence is commonplace, we all know the NZ police love to raid homes (mostly rentals) and arrest people, hey its part of their job. In this case it was an extremely luxurious rental to be sure (thanks Chrisco!). Normally its for life threatening crimes against humanity such as growing herbs in the backyard or holding audio tapes from conversations made by corrupt politicians. This time however it was because they had been working with US authorities in a timed attack on internet freedom under cover of protecting copyright. The arrest of the people running MegaUpload was quite nicely timed in the middle (well nearing the end) of the debate around SOPA/PIPA (though the spectre of terrible internet controlling legislation will be around for awhile yet). The arrests speak further to the propaganda of ‘stopping piracy’ when really whats at stake are our internet freedoms. Labour MP and party IT spokesperson Clare Curran didn’t come out against the bill directly (correct me if I’m wrong) which is standard fare from Labour, all sizzle no sausage. Although, they have retrospectively come out against the ‘Skynet’ bill (which they voted for in the first place allowing it to pass) Labour and it’s MP’s are guilty of being just as un-knowledgeable as some of the rest of the worlds politicians when it comes to ‘Teh Internetz’. Cracks me up. Still, better than nothing from Labour though eh? Speaking of nothing, National MP Amy Adams, National’s Technology spokesperson, came back to the poor bloke with nothing, not even a ‘Thankyou for your email but we receive a lot of correspondence and no matter what the public say we’ll do what we’re told by large corporate interests‘ type email. Pretty lame if you ask me. But as one of the commenter’s on that same Stuff article points out, that’s standard fare for National, ignore it and hope it goes away, or if it doesn’t, change a law under urgency. No surprises there. If Labour dressed up and took the odd free dinner date from US corporate interests every once in awhile for the sake of ‘beneficial mutual relations’, then National goes straight to bed and skips the foreplay. National and the US are more like best mates than Labour and the US, which at least have a love/hate relationship. Read Nicky Hagers book ‘Secret Power‘. I won’t get into the other parties, National ACT MP John Banks couldn’t rub two internetz together to start a book burning fire and unconfirmed sources report United Future MP Peter Dunne may still be using Windows NT. Hone wouldn’t have a bar of it I’m sure, he gets it, and NZ First would probably need Curwen’s help to get their head round it. So back to the NZ Police raiding the homes of ‘internet criminals’, oh wait they were providing a service that non-criminals used too? And now the whole future of the cloud is at stake? Noone wants to upload their files anywhere, legal or not, if the government keeps on shutting down every site that hosts ’em and then steals them all, like some sort of modern day pirates plundering booty to take back to their island where they amass their riches, oh wait… SNAP! Talk about double standards! This isn’t a blog post about the evils of piracy, its about the evils of restricting the internet and bowing down to corporate pressure so they can ram their views down your throat while making shedloads of money from it, all the while denying people their rights. Oh and by the way, if you’re against SOPA/PIPA and have been tweeting and facebooking about it, and voted for National, why? 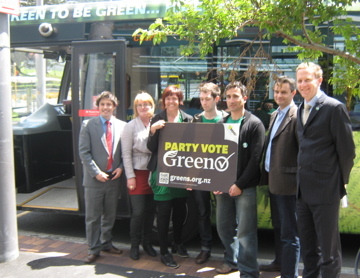 Don’t forget that the Greens were the only Party to vote against the Copyright (Infringing File Sharing Amendment) Act 2011 which attempts to do largely the same thing. 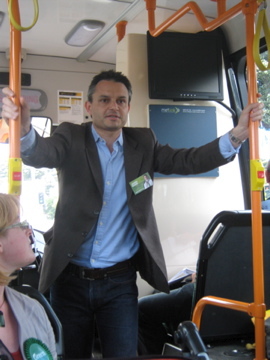 Frogblog already has an extensive post by Green MP Gareth Hughes on the background to these protests, so I won’t go over that again. 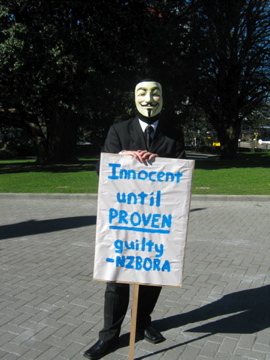 There was a much bigger turnout for the Auckland protest, which eventually occupied an entire intersection in Queen St and shut down traffic briefly until the cop cars converged, but Welli turned on a fine day and a bunch of people came with their hand-made placards. 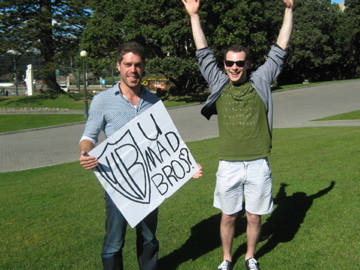 There were representatives of the Pirate Party of NZ, handing out material that they don’t appear to have worked out how to print double-sided yet; and a few from the Open Source Society, and just a bunch of general geeks in blackout clothing. It was a pleasant enough get-together for a sunny Saturday in Welli, might be useful to do it again when Parli is actually sitting in the House, tho’. Gareth Hughes in da House! 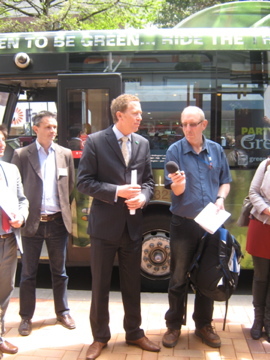 Today held a brighter event for me, and for many of the past members of the Greens-at-Vic club, the Young Greens wing of the Green Party, and a whole lot of Greenpeace activists. At 5.45pm promptly, just after the Speaker, the Hon Lockwod Smith, had regained his seat, Gareth Hughes began his first speech in Parliament. He made much of his status as the youngest MP in the House, but also gave a pretty good overview of where he’s been since he was an 18-year-old Gisborne boy-racer who liked his hamburgers. 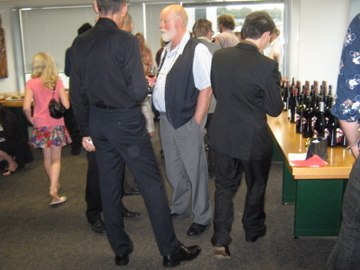 The galleries were crowded with family, friends and collegues and most of us trooped in an orderly fashion over to the Green Party floors in Bowen House for a speech or four, some waiata and a few drinks and nibbles with our new ‘man about the House’. Young Arlo Hughes, much referred to in the Speech, amused all of us during the reception speeches by piping up and interjecting, whilst providing the floor-show. The text to Gareth’s speech is here. 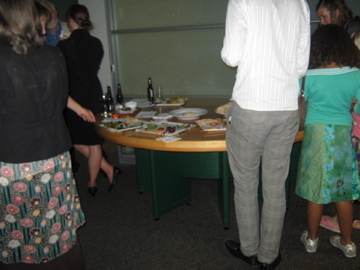 And in usual form, here’s some crowd shots of the reception! Funny trend emerging – Labour’s new generation of MPs is my generation – in fact I knew some of them when I was younger. But the new leaders in the Green movement seem to be coming mostly from the generation after mine. Maybe they are people who grew up with the Green Party being a sustainable ongoing political force, rather than a newly emerging parliamentary party? Maybe the evidence supporting the Green cause is becoming even more compelling for young students and young adults? Anyway, the best example of this new generation is soon-to-be MP Gareth Hughes. I’m delighted he’s got the chance – he’s one of the most positive and optimistic people I’ve met, he’s studied and learned from many of the current and former Green MPs and he also genuinely wants to be an MP because he to make a difference. I’m pretty sure he’s going to make a difference. Good luck Gareth and welcome back to Wellington! Along with new MPs Kennedy Graham and Kevin Hague, David and Gareth signify a change in the Green Party’s political orientation and flavour… With this new influx, the Green Party is likely to become a more emphatically ‘green-wing’ party than has been possible in the past. I come from that “old left element” of the party, and I’ve always thought the concept of ‘green-wing’ is fundamentally flawed. While the left-right political spectrum is not the only political divide it is an important one that you cannot pretend doesn’t matter. The most Green of issues – climate change, water quality, conservation etc – cannot be solved, to my mind without at least some decent left-wing state intervention. 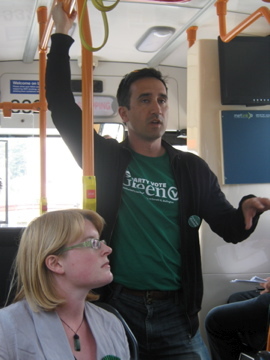 Gareth Hughes might fit the stereotype of young, urban, tree-hugging Green better than Sue Bradford, but I’m pretty sure I’ve seen him out supporting Unite’s $15 minimum wage campaign and other ‘left wing’ causes – because that stuff is about core Green values. One potential new MP does not make for a change in direction – at least not one that I can discern. I’m expecting the Greens to remain the only party in Parliament that consistently speaks up on the left-wing issues I care about. Sue Bradford has particular emphases that are different to those that Gareth will have as an MP but the values of the party are not, as far as I can see, going anywhere new.